No matter how busy I am, I make sure that I carve out some time in my week to sit down and do some crafting for myself. Especially right now, these little projects are keeping me sane! You might recognize this as a Sunday Patchwork project. I had decided that the pieces needed to be hand quilted and made into a Hoop Travel Bag. I started the hand quilting back in March and I was finally able to finish it off when we went to the cottage. Although I own a hoop bag already, this was the first one that I made. 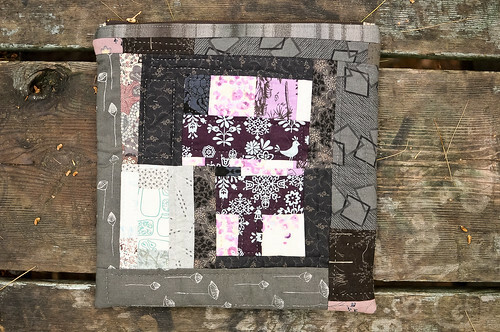 I had trimmed down my patchwork pieces to the final dimensions of the outside pieces in the Frosted Pumpkin Stitchery pattern and followed the instructions from there. It came together really quickly and was so fun to make. It took me just over an hour to construct the pouch and I was almost giddy when I finished it. Sewing is good therapy. magnificent! 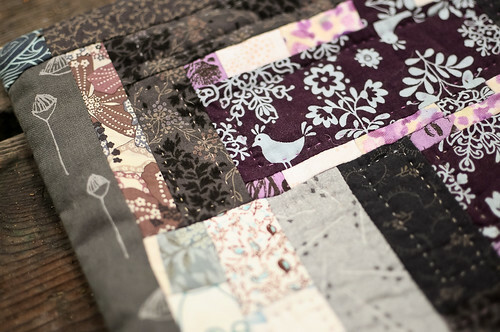 i like the quirky nature of the patchwork; planned yet spontaneous. Very pretty, KAryn. Where do you get your metal zippers? jeni & anastasia – thank you!! 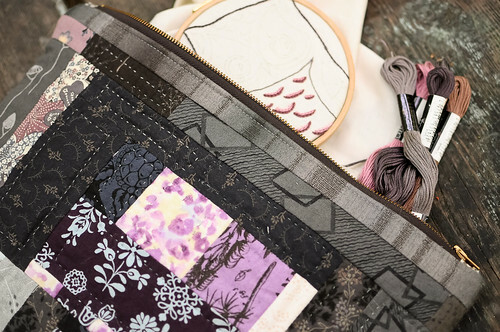 lesly – i go to leather & sewing supply depot at 7 Vanauley St. (near Queen & Spadina) they have a million zippers in all sizes and colour, plus tons of other sewing supplies. Those hoop bags are such a good idea. 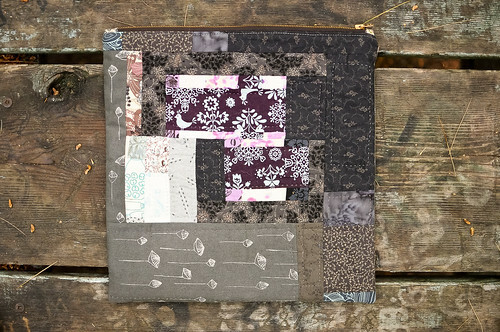 I’ve been wanting to try out hand quilting too and something like this would be a nice, not too intimidating beginning. karyn, for some reason that first sentence about finding time each week to make something is really banging my gong. it does seem like a very healthy practice when things feel like they are unravelling. best of luck wading through the mire of your hard drive scenario…i know you’ll come out on top! ps: I think I might need you to get me some of those zippers! so great! What a lovely bag, your colours and fabrics are gorgeous. And I know what you mean about needing to do some crafting to keep sane!! I hope you don’t mind but I linked to your blog in my recent post on a dress I made – I loved your tie dyed dress and was inspired by it. Love your blog! 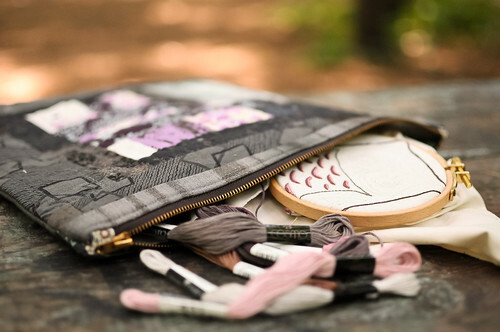 Now, is it a coincidence or planned or subconsciously serendipitous that your current embroidery project matches the bag?